When substantial changes to the Internal Revenue Code were being considered during deliberations on the Tax Cuts and Jobs Act of 2017, one of the touted benefits was to simplify tax filing. The goal was for many Americans to be able to file their individual income tax return on a form the size of a postcard. IRS forms drafters arguably accomplished this task, as revealed when the 2018 tax year Form 1040, U.S. 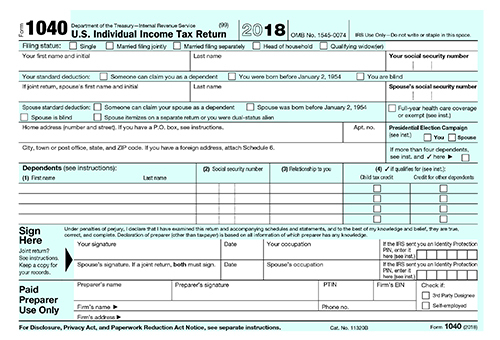 Individual Income Tax Return, was released in June of 2018. Though the form itself is only a half-page long on both sides, it was soon apparent that there was no place on the form for much of the taxpayer information it formerly captured. Released at the same time as the 2018 Form 1040 were several schedules that are to be used by individuals to report various items of tax-related information. One example of this transfer from tax form to tax schedule is the reporting of information pertaining to IRAs, HSAs, and self-employed contributions to certain retirement plans. While all such information was reported on the longer Form 1040 in 2017 and prior tax years, several important items have been shifted to schedules that will now be filed in tandem with Form 1040. Here, briefly are examples of items retained, and items changed. Distributions from an IRA will continue to be reported on the main Form 1040, Line 4a. New Schedule 1 will be used to report deductible contributions to IRAs (Line 32), HSAs (Line 25), or to SEP, SIMPLE IRA, and other retirement plans by the self-employed (Line 28). The “saver’s credit” that is available to certain low-to-moderate income taxpayers for IRA and employer retirement plan contributions will now be reported on new Schedule 3 (Line 51). Amounts withdrawn from IRAs and other retirement plans that are subject to the 10 percent early distribution penalty will be reported on new Schedule 4 (Line 59). Interestingly, line numbers for these items will remain the same on the new schedules as they were on the 2017 Form 1040, despite the fact that the schedules have fewer lines. For example, Schedule 4 captures only eight items of information, but begins with Line 57, retaining the same line-item number found on the 2017 Form 1040. As such, a 10 percent early distribution penalty owed will continue to be reported on Line 59, but on Schedule 4. Similar relationships between line number and the information reported hold true for the other new schedules. As a result, individuals who report these items will find the line numbers familiar, but must complete and file separate schedules with their Form 1040.